In 12 days, Nebraska will play a football game. 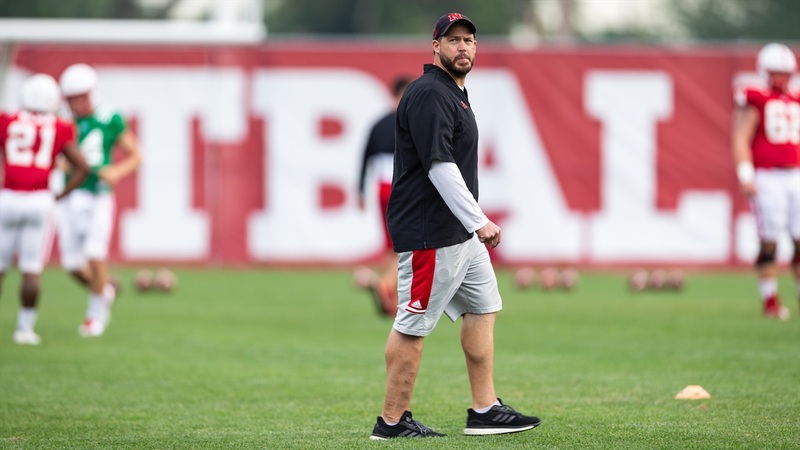 If Erik Chinander needed to release a depth chart right now of his defense, if head coach Scott Frost asked for one, the defensive coordinator would be able to give it. The defense knows who its ones and twos are at this point. Separating them is the issue. On the defensive line – probably the deepest unit on the defense according to Chinander – they know who the six guys are, they just don’t know which three go first and which three go second. “There’s been days where you can say Ben Stille is the best guy. There’s been days where Carlos Davis has been the best guy. There’s been days where Mick [Stoltenberg] is the best guy. There’s been days when Freedom [Akinmoladun] is the best guy. There’s been days where you say, ‘Who’s the next guy off the bench?’ and it’s Khalil [Davis]. Maybe Khalil should be in the starting lineup,” Chinander said Monday after practice. “So, I think what you’re seeing out of that group is everybody’s playing really well but I haven’t seen one guy just dominate and be consistent yet. At the next level – linebacker – it seems like the top four guys on the outside have separated and three guys inside have a stranglehold. Luke Gifford, Tyrin Ferguson, Alex Davis and Breon Dixon have taken over for outside backers coach Jovan Dewitt while Collin Miller has moved inside to provide depth. Then there’s the secondary. A self-professed worry spot of Chinander’s heading into fall camp has tightened up fast. “Another deep position with the additions of some young guys and where we’re at is probably the defensive backfield,” he said. He’s not surprised by the jump from the spring to the fall, but he’s happy about it nonetheless. “The best part is the guys that were here before, the older guys, they kind of fed of the competition the new guys brought. Chinander says there are a few battles in the secondary that will go down to the wire, though he didn't specify where. No one has any love for defensive backs coach Travis Fisher, it seems. “Guys are making it hard for me,” he said. “I got like six or seven guys to be honest with you. That’s the way I wanted it. When you talked to me in the spring, I had one guy. Maybe one and a possible [other]. Now I have six or seven guys." Freshman quarterback-turned-corner Cam Taylor has impressed everyone, but Braxton Clark is also pushing his way up the room. All things considered, there doesn’t appear to be a group that this defensive staff is overly worried about heading into the season. Asked point-blank if he was concerned about anyone, Chinander said no. >> With classes starting on Monday, there are a few logistical changes to practices moving forward, but Chinander said nothing major will change for the team. Afternoon meetings will be more limited, but Chinander said they’ll condense more to compensate. Guys not on the initial 110-man roster are back with the team but they weren’t in pads Monday. They did individual work but not much else. Chinander said that group has embraced special teams as their way to get in and help the team this season. “I think we’ve seen an explosion in his ability to play. I think he’s gotten to the point now where he has his sea legs back. You go through not being used to the movements, getting used to the movements, then you get to camp and, ‘Oh God, I’m sore.’ Now, he’s starting to get to the recovery phase where his mind and body have caught up to each other. Now he’s showing explosiveness off the edge. He’s got a really good ability to pass rush. I’m excited about that one." >> Chinander said senior defensive tackle Mick Stoltenberg has turned into one of the team’s most-respected voices. He said Stoltenberg has become a guy that Frost and the rest of the staff can essentially speak to the team through. >> One of the goals of the staff upon arrival was to make football fun again for the team. Several coaches have talked about taking over a team in Central Florida that just didn’t like playing the game anymore and about how there were traces of that in Lincoln when they arrived. He’s not going to speak for other groups, but defensive line coach Mike Dawson said Monday that has changed within his. “I hope they're having fun. It seems like they are. I know they're playing with a lot of passion. I can only measure it on film how fast they get to the ball and their strain and how much it means for them to get to the ball,” he said. “They've done a great job of that and even walking up the stairs and talking to one of the coaches, they were flying around today. >> Asked if there was any difficulty in preparing for a conference that runs both spread-style offenses and, well, punch-you-in-the-mouth power games, Chinander said they’re getting all kinds of looks in practice from the spread stuff, but they know how to handle others because of their calls. >> Fisher said they’re still working through missed tackles in the secondary. It was a major issue last season at every level of the defense and one of the more important things fans want to see changed. Stoltenberg said the team is putting an emphasis on it. “People talk about missed tackles, well there’s not going to be as many missed tackles if you’ve got two or three hats on the tackle,” he said. “So when we’re getting more bodies to the ball, those missed tackles won’t happen and the ones that do happen will be covered up by another dude that’s hustling. That’s part of it.